HFT The Gardener is a project comprising multiple bodies of work by the fictional character Hillel Fischer Traumberg. Traumberg is an algorithmic high-frequency trader (HFT), who experiments with psychoactive drugs and investigates the ethnopharmacology of over a hundred psychoactive plants. He uses gematria (Hebrew numerology) to discover the numerological equivalents of the plants botanical names with companies in the FT Global 500 Financial Index. He communes with the traditional shamanic users of these plants whose practices include healing, divining the future, entering the spirit world, and exploring the hallucinatory nature of reality. Traumberg develops a fantasy of himself as a techno-shaman, transmuting the spiritual dimensions of the universe and the hallucinogenic nature of capital into new art forms. He becomes an outsider artist whose work is collected by oligarchs, bankers and corporations. Unaffected by success he continues his parapsychopharmacological research, working on a new algorithm to discover the true nature and location of consciousness. 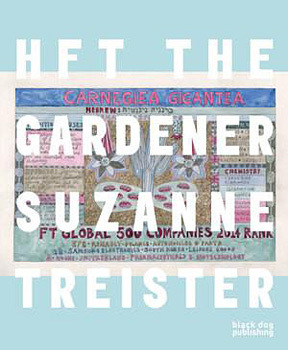 HFT The Gardener extends Treister's fascination with esoteric translation, the cybernetics of consciousness, and the hallucinatory aesthetics that radiate from real-world circulations of power. Her fictional character Hillel Fischer Traumberg is an HFT - a high-frequency trader. But this HFT is also a contemporary version of HCE, the hero of James Joyce's Finnegans Wake, who struggles to awake in the wake of modernity's dissolution of the boundaries that separate art, nature, language, math, money, and the traumatic Traum of history.